"Originally prepared as a special dinner-for-two, boneless, skinless chicken breasts are prepared with a white wine combination and then slow baked to melt in your mouth for a gourmet taste without a lot of fuss." 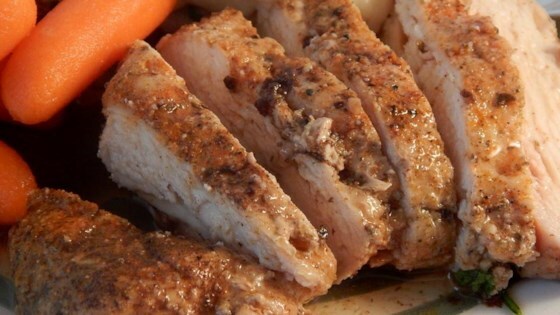 Season the chicken breasts with garlic powder, poultry seasoning, salt, and pepper. Place the breasts in a 9x13 baking dish. Whisk together the wine, Worcestershire sauce, and vegetable oil in a small bowl; pour the wine mixture over the chicken breasts. Cover the entire dish with aluminum foil. Bake in preheated oven about 45 minutes; uncover the dish and spoon the liquid from the pan over the breasts. Recover with foil and bake until the juices run clear, another 20 to 30 minutes. This was a very easy recipe and was so good! I just baked it for 50 minutes only with the foil covering it the whole time and the chicken was very tender and juicy. Great meal! This was fantastic. I actually rubbed a little bi of chicken bullion on the chicken breast as well. Maybe i made it wrong, but it wasn't all that great. The chicken was really over cooked by following the directions. Next time I would cook it for less time and add some veggies, this was a little plain for me. This was good, but the sauce was too oily. Next time I will try another suggestion and substitute cream for the oil.